Not often, but every once in a while, you come across an artist who is so full of talent, you’re wondering where he’s going to go and do next. Scottish multi-instrumentalist and bedroom producer Christopher Duncan, who goes by the stage name C Duncan, released his debut album ‘Architect’ last year, grabbing a 2016 Mercury Prize nomination and critical acclaim. Classically trained yet also well versed in more traditional rock band instruments like guitar and drums, his exceptional background gives him an edge over his electronic / dream pop contemporaries. For his latest effort, sophomore LP ‘The Midnight Sun’, Duncan not only made the music on the album, but as an accomplished painter, also made the cover art himself too. He says he wanted the image of a dimly lit staircase in a house to reflect the environment in which the album was made. I mean, seriously? It’s like the brothers in Field Music. Dude, can you stop being so selfish and leave some talent behind for the rest of us? The normal looking, yet oddly ominous cover is also a convenient segue into Duncan’s conceptual starting point with this album: he named his newest work after his favourite episode of the American suspenseful cult classic The Twilight Zone. However, you’ll find ‘The Midnight Sun’ as a whole is less about leaving you terrified than to create a sublime mood, something it seems that C Duncan is a master in fashioning. This kind of music is largely chill, not chilling. And that’s just fine by this music editor. As you listen to this album, it’s easy to forget that this was all written, recorded and produced in Duncan’s bedroom. Entirely by himself. His ethereal vocals on standout ‘Like You Do’ provide just enough warmth to strike the perfect balance with the iciness of the synth notes and the soft swishes of percussion. In a track-by-track breakdown of the album with The Line of Best Fit, he explained it was written with the intention to reflect the daily struggles of a friend with depression, and it conveys this well. Similarly beautiful vocals appear on ‘Other Side’, which begins solemnly with piano chords and a rolling drum beat. But first impressions can be deceiving: the track opens up into a sweepingly euphoric track broken up by chimes. The beauty of layer upon layer of synths on ‘Wanted to Want It Too’ achieves a unique, otherworldly feeling, unlike anything you’ve ever heard. Speaking of otherworldly, Duncan might as well be on another planet for ‘On Course’, rhythmically interesting and with angelic voices seemingly singing as part of a sci-fi choir, and also on the celestial ‘Jupiter’. 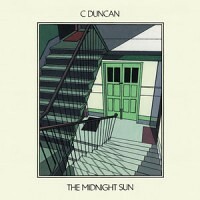 On ‘The Midnight Sun’, C Duncan takes full advantage of his background in choral music and combines it with his strengths in dream pop and electronic orchestration. It’s a wonderful next chapter from Glasgow’s chief ‘Architect’ and an album to keep your cosy through these winter months. ‘The Midnight Sun’, C Duncan’s brilliant follow-up to his 2016 Mercury Prize-nominated debut ‘Architect’, is out now on FatCat Records. You can watch a live version of album track ‘Do I Hear?’ below. He’s been announced as the support act during Elbow’s March 2017 UK dates, starting the 1st of March at Birmingham Academy. For more on C Duncan on TGTF, go here.